As mentioned in my previous post about how to peal a peach, I recently went to my favorite u-pick. Not only did I come home with peaches, I also picked what the farm calls, a variety pack. 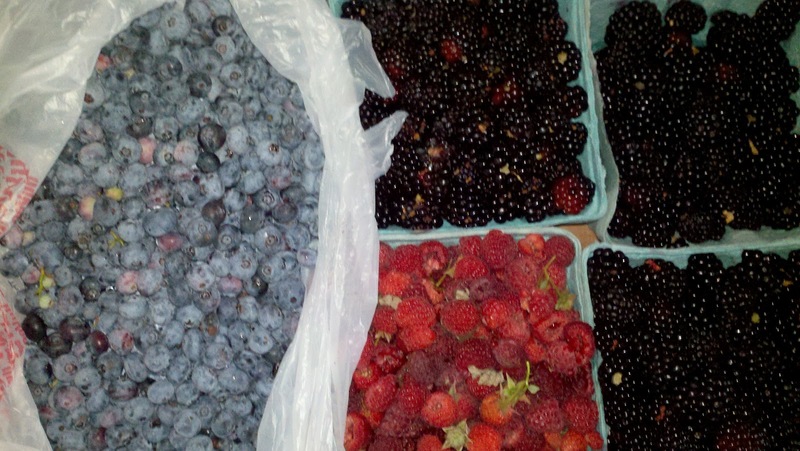 Big delicious blackberries, raspberries and blueberries. 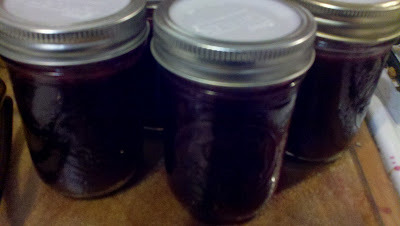 I managed to get through canning all of the peaches and raspberries over the weekend. Last night I wrapped up the blueberries and blackberries. 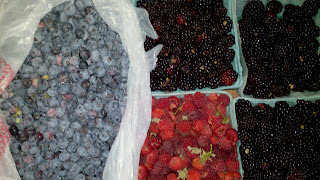 Prior to canning, my 5 year old instructed me to freeze at least 1/2 of the blueberries so we can use them in smoothes. Who am I to argue with a child who wants to make sure she has nutritious smoothies, so I did just as I was told. I didn't want to make any more jam or preserves so I opted to make berry concentrate following the suggestions from Mother Earth News. I figured we would be able to enjoy wonderful summery drinks this way or use the concentrate in our smoothies. My 5 year old would be happy. The process was quick and easy and as a sweetener I used local honey. These 1/2 pint jars will end up making 24 ounces of juice when diluted with water. I would be interested to hear about other juices that some of you have canned. Recipes seem to be difficult to find yet easy enough to do. Please feel free to share below any tips below.